The National Commission for Scheduled Castes today directed the SIT formed on its directions to immediately arrest culprits accused of beating and stripping a dalit as well as outraging the modesty of his wife besides taking action against police officers who indulged in “criminal negligence” by failing to stop the atrocities at Bagga village in Majithia in April. The case was brought to the attention of the Commission earlier by Majithia legislator and SAD general secretary Bikram Singh Majithia.Commission Director Raj Kumar Chenana made these observations following a meeting with SIT IG L K Yadav and the dalit victims as well as former minister and SAD general secretary Bikram Singh Majithia and BJP representative Vineet Joshi. The SC Commission Director also observed that the SIT had not registered a FIR in the case as per the complaint of the victims and that this anomaly should be rectified immediately. He called for immediate action against police personnel who indulged in criminal negligence by not taking action on the complaints of the victim. He also asked SIT to examine how a case had been registered against atrocity victim Kashmir Singh and two other relatives three days after he was beaten and stripped. The Commission indicated that this action was an after effect of the complaint submitted by the victim. It said two relatives of the victim who were in jail due to this should be released after reviewing their case.SIT IG LK Yadav while briefing the Commission said arrest warrants were being issued today against three accused including Congress leader Lakhbir Rinku who had beaten and stripped Kashmir on April 17 and posted a picture of the incident on face book along with derogatory language. Mr Yadav said he would also look into the case of arrest of two relatives of the victim’s family besides assuring that the role of the police personnel associated with the incident would also be examined.Briefing the Commission, Mr Majithia said even fifteen days after the victims had submitted a complaint to the Commission they had not received justice. He said no arrests had been made till yet. “People who committed the crime are roaming free and even threatening the victims. A concerted effort is being made to protect the criminals as well as police personnel who aided the accused in committing the atrocities. 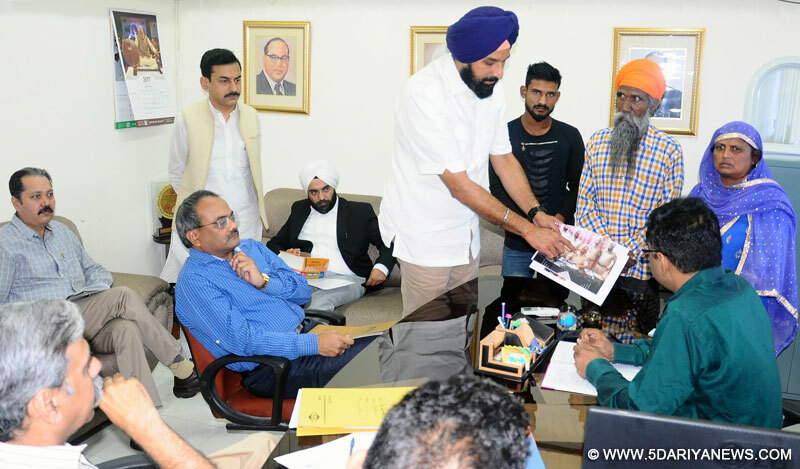 No action has been taken against ASI Avtar Singh who informed the accused about the complaint made by the victim’s daughter to the 181 helpline resulting in an attack on the family on April 29”.Mr Majithia also disclosed that he had handed over a letter written by defeated Congress candidate from Majitha - Sukhjinder Lalli demanding that ASI Avtar be posted with him as a gunman before the assembly elections. He said the same Avtar had been posted as SHO of Mattewal against police rules which clearly stipulated that an ASI could not head a police station. “Despite all this Avtar has been given a coveted post in the Police Lines after being shifted out as SHO”, he added.Later while addressing newsmen along with BJP leader Vineet Joshi outside the SC Commission’s office, Mr Majithia said he had requested the Commission to depute Chandigarh police personnel or those of any central agency to guard the victim’s family which was unable to go back to its home due to continued threats from the accused whose uncle Jagdev Bagga was a prominent Congress leader of Majithia. He said in case the victims did not get quick justice they would approach the Punjab and Haryana high court.